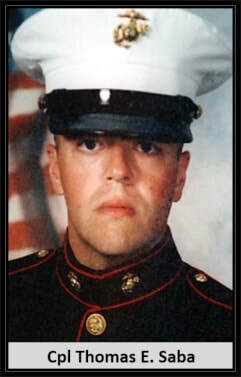 Died: February 7, 2007 in Operation Iraqi Freedom. Unit: Marines, Marine Medium Helicopter Squadron 262, Marine Aircraft Group 36, 1st Marine Aircraft Wing, 3rd Marine Expeditionary Force, Okinawa, Japan. Cpl. Thomas Saba of Toms River, NJ., was a 1994 graduate of Susan Wagner High School and moved with his family to Toms River in the late 1990s. He attended the College of Staten Island, pursuing studies in liberal arts and also worked in Fortunoff, Woodbridge, and as an assistant manager at United Artists' former Travis Theater. He made a five-year commitment to the Marine Corps shortly after 9/11, enlisting on April, 21, 2002. For most of that time, he was assigned to the Marine Medium Helicopter Squadron 262, The Flying Tigers, in Okinawa, Japan. The January deployment to Iraq was the first combat deployment of the squadron since the Vietnam war. 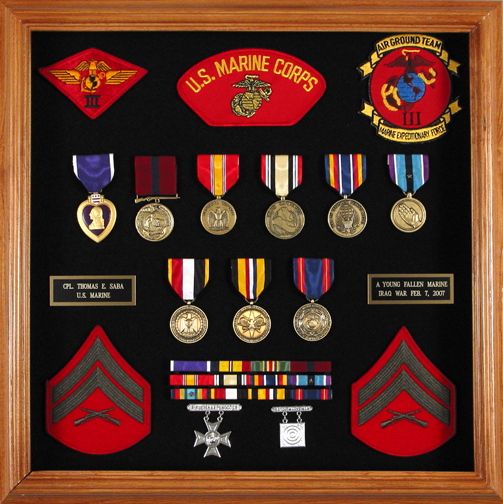 He was posthumously awarded both the Purple Heart and the Combat Action Ribbon. 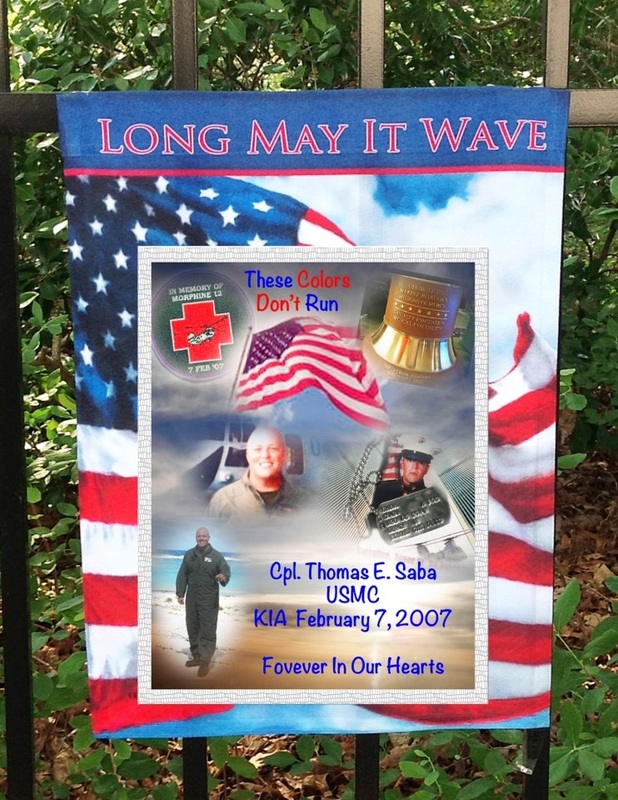 Thomas was honored on November 14 2007 with the unveiling of a park bench in his memory at the Lake Ridge adult community where his parents live. The granite bench with an inscribed dedication is placed in front of the community's clubhouse. He was killed when his helicopter was shot down in Baghdad at age 30. 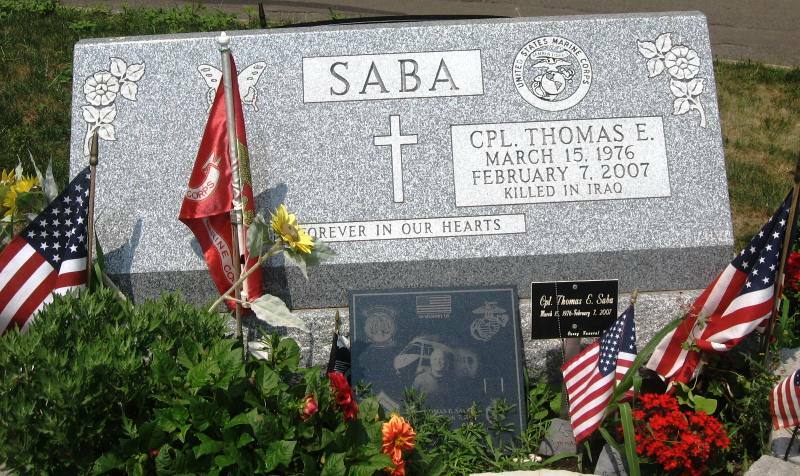 On February 7, 2009 in Staten Island, NY, Marines, family and friends gathered to pay tribute to the life and sacrifice of Corporal Thomas Saba on the second anniversary of his death in Iraq. After mass and a visit to his alma mater, Susan E. Wagner High School, the entourage continued to Moravian cemetery where the somber ceremony was marked by a 21 gun salute and a fly-over by two CH-46 Marine helicopters. A celebration at the local Marine Corps League ended the day's festivities. The Saba family wish to wholeheartedly thank all those who attended and those who were instrumental in the planning and execution of the memorial. 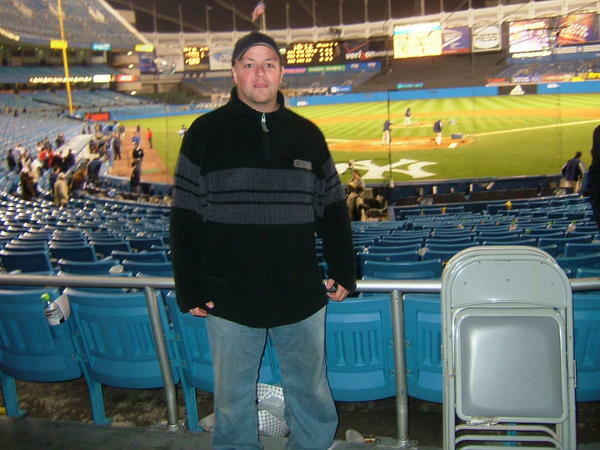 Marine Corporal Thomas E. Saba from Toms River, New Jersey, had a MySpace page that featured a New York Yankees backdrop and a picture of him standing in Yankee Stadium. The page listed 41 of his friends, many of whom learned of Thomas’ death through the page because his sisters posted messages to his friends.”My God, Tom, I was just talking to you not too long ago. I knew how excited you were to go! You are in our thought(s) and prayers,” wrote one of Corporal Saba’s friends.Another friend wrote: “Shocking and sad news to hear. Good guy with a generous heart. You’ll always be in my memories. Thank you for what you’ve sacrificed for us all, with love always, your friend.”Corporal Saba was assigned to Marine Medium Helicopter Squadron 262, Marine Aircraft Group 36, 1st Marine Aircraft Wing, III Marine Expeditionary Force, Okinawa, Japan. He died on February 7, 2007, when the CH-46 Sea Knight helicopter in which he flew crashed near Fallujah while supporting combat operations in Anbar Province, Iraq. Four other Marines and two Navy medical corpsmen on the helicopter mission to evacuate casualties perished with him. Although Corporal Saba could have been discharged in April 2007, he extended his duty by seven months so he could serve with his fellow Marines in Iraq. “He didn’t have to go to Iraq. He chose to go. He wanted to be with his brothers,” Barbara Saba, the Marine’s mother told the Staten Island Advance. Mrs. Saba and her husband, Anthony, had last spoken with their son by telephone just three days before he died. His body is buried at Moravian Cemetery on Staten Island. The 30-year old Marine spent most of his life on Staten Island, were he grew up with his brother and two sisters. After his parents moved to Toms River, he remained on Staten Island to make his own life. But he stayed at their home in 2002 for several months prior to reporting to boot camp at Marine Corps Recruit Depot, Parris Island, South Carolina.